Electronic and digital systems generate completely new forms of migration. In the creative arts, new phenomena related to migration and the synergies of disparate systems are emerging. Artistic products evolve from traditional forms into hybrid digital forms. Analog products are being digitized; data spaces are trans-located from one data storage system to another; existing sounds, images, and texts are remixed and fused into new datasets. 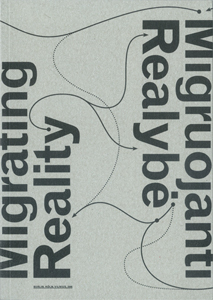 The book is based on international conference and exhibition Migrating Reality which took place on April 4-5, 2008 in Galerie der Künste, Berlin, Germany, and on material submitted to the online magazine balsas.cc. As with the conference, the exhibition, and the on-line projects, the book is an overview of the migration topic from various perspectives, not excluding the use of a variety of languages. For example, we offer the reader an interview with Žilvinas Lilas “Bastymasis man būtų daug priimtinesnis žodis” conducted by Vytautas Michelkevičius in Lithuanian and the text “Kulturtransfer in der Frühen Neuzeit – eine andere Realität der Migration” by Philipp Zitzlsperger – an essay on migration from a historians perspective. The ideas presented textually in the book shift back and forth from essays and articles to projects and back to essays. The territories shift from social space to virtual space and eventually land us back in a realm of physical, political, economical, and historical reality. >top – Verein zur Förderung kultureller Praxis e.V.